New clients to bid online or buy after sales, please register here. Existing clients, please sign-in above. Note: we have moved to 64 Parramatta Rd, Forest Lodge (Glebe), opposite Sydney University Veterinary Clinic. 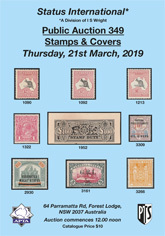 Prices realised for Auction 349 (Stamps & Covers) are now available. Unsold Lots Available for Direct Purchase at indicated reserve plus 19.25% buyers commission plus freight. Prices realised for auction 349 stamps & covers are now available. Please click here to view online. Download in word format click here. 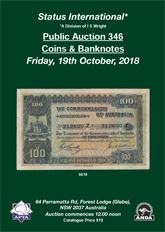 Prices realised for Auction 346 (Coins & Banknotes) are now available. Unsold Lots Available for Direct Purchase at indicated reserve plus 19.25% buyers commission plus freight. Prices realised for auction 346 coins & banknotes are now available. Please click here to view online. Download in word format click here. 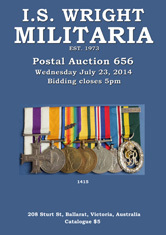 Prices realised for Auction 656 (Medals & Militaria) are now available. Unsold Lots Available for Direct Purchase at indicated reserve plus 19.25% buyers commission plus freight. Prices realised for sale 656 medals & militaria are now available. Please click here to view online. Download in word format click here.